My name is Michael Smith and I live in West Monroe, NY, Oswego County. 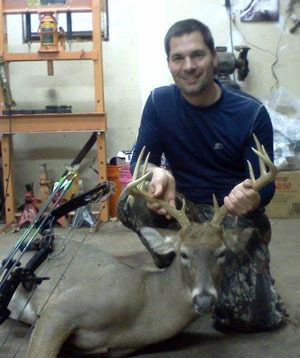 I took this 9-point buck on September 28, 2012 about 6:00 p.m. during the Late Bow Season for Northern Zone on my own property. I first saw the buck on the 27th, opening morning, and thought it was a big-bodied 6-point. I was walking away from my stand and noticed him staring at me. I froze until he slowly walked off. Once he was out of sight, I went back inside. The following evening, about 6 p.m. he showed up about 125 yards away. I was already in my stand and quickly retrieved my bow, hoping he would come my way. Without missing a beat, he meandered his way over to me, jumping over brush piles and pausing to munch on some tree tops from last year's logging. I noticed he was not a big 6-point, but a very respectable nine point. As he came closer, I planned the kill if he would come out to an opening on my trail. I had a long, but very clear shot at about 42 yards with him quartering to me. He jumped over the final brush pile and I drew back, anchored and spoke aloud to him saying, "Deeeeer!" He stopped, looked up as the arrow was already on it's way. I hit him high on his left side and heard the distinct "drum" sound of a punctured lung. He ran off what looked to be about 500 mph. I waited about 15 minutes and slowly got out of my stand to retrieve my arrow. I got to the impact site and did not see the arrow...or any blood. Assuming I had a long night ahead of me, I went inside to have dinner and think of my next plan of action. I decided to ask my neighbor for a helping hand in the tracking. It was now dark and not one drop of blood was to be found. We split up and combed the area. I started walking in the area where I knew he ran off. My instincts told me to keep to the woods and there I found him in a heap no more than 50 yards from the impact site. I noticed a bulge in his right side. It was my arrow. The arrow entered high on his left side, and because of the angle, the arrow went into his right rear leg..all while staying completely beneath the skin. The nock of the arrow punctured his right lung with every step he took, thus making a very quick kill. There was only a small amount of blood found where he laid down. I was stoked to see him, make the shot and recover him on the second day of the Late Bow Season, September 28, 2012. 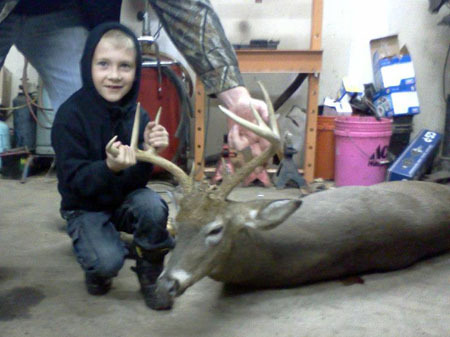 The little boy is my son, Sullivan, with my neighbor, Chris Fields, helping Sully hold the buck's head up. He was as proud as his dad!